Dragon NaturallySpeaking & DMPE Training / Installation Manual - Download ONLY! 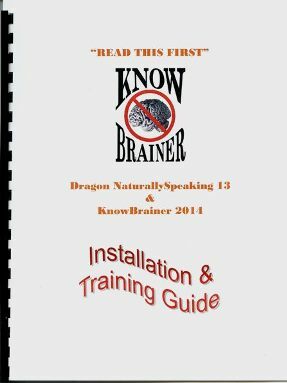 Dragon NaturallySpeaking 12, 13, 14, 15 or DMPE2.3.1, DMPE4.2 Training / Installation Manual- Download ONLY! NaturallySpeaking / Dragon Medical Installation / Training Manual - Download Option ONLY! Are you exhausted from trying to properly install your software, could you use a little help? Our Exclusive Installation and Training guide for Dragon NaturallySpeaking, Dragon Medical and KnowBrainer Command Software. The KnowBrainer manual is designed to first get you up and running in a timely manner whether you're a computer expert or a novice. The KnowBrainer manual is full of helpful pictures that'll guide you along with confidence in your installation process. There are sometimes pitfalls when installing NaturallySpeaking or Dragon Medical and the KnowBrainer manual will help you to avoid these problems as well as sharing some best practices. Once Installation is completed you can take advantage of intermediate through advanced training. Our NaturallySpeaking and Dragon Medical software customers receive a free copy with their shipment by default but if you didn't get your software from us you may purchase the KB Manual today and we'll send you a Download today.